Painting is therapeutic as it takes you to a level of serenity that you rightly deserve! It's up to you how you experiment with the talent that nature may have gifted you. For some it comes naturally while to the rest through hard work and persistence;, nonetheless, you should give it a try and discover yourself either through experimentation or an expert guidance. I read a rather intense thought yesterday which questioned, "How many times have people used a pen or paintbrush because they couldn’t pull the trigger?”- Virginia Woolf. 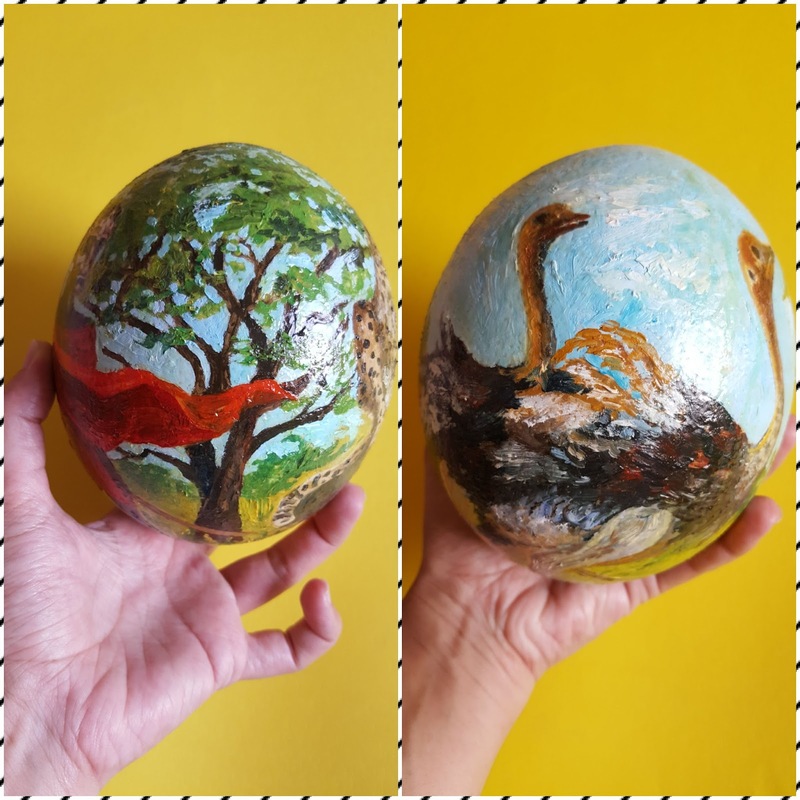 A few weeks ago, our company CEO requested me to paint an ostrich egg that he had preserved over the years. And to all environmentalists and animal lovers out there, let me mention over that it was an infertile egg that he got drained. The moment you hold this egg you would me amazed at how hard an ostrich egg shell is, it's really a piece of art by nature itself. The giant flightless bird, ostrich can lay about 40 to 100 eggs per year! To me it was a completely new experience as I had never painted anything beyond a chicken egg and that too was during my school days. If you are to hold this enormous egg you'd realise how many people it would possibly feed as it weighs 1.4 kilograms on average and can feed up to 12 people. 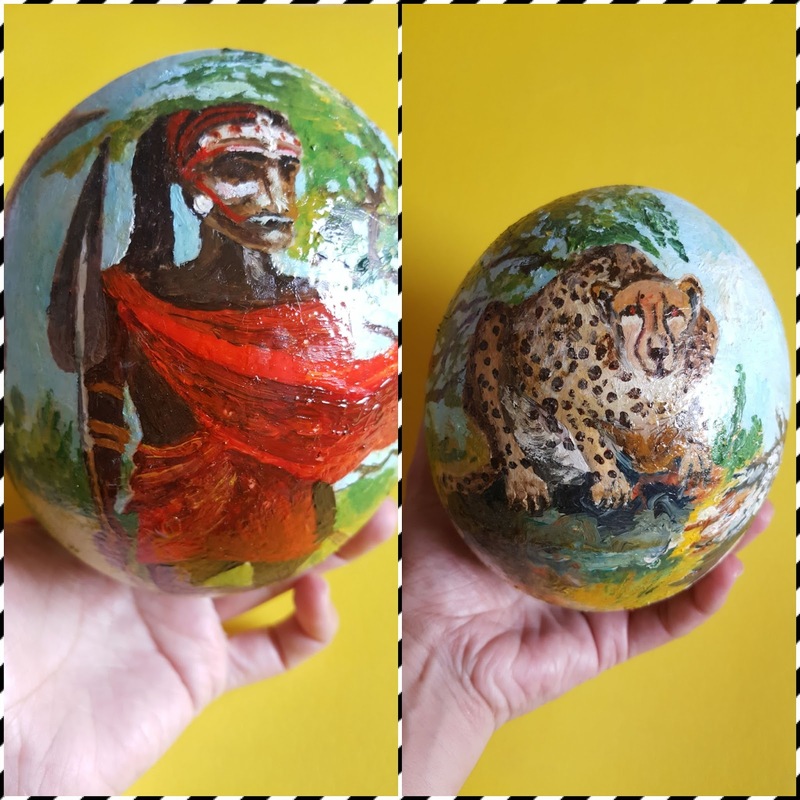 So according to the request, here's what was needed to be painted; ostriches running in jungle, a cheetah ready to pounce on them any minute, an acacia tree, and a Maasai Tribe man. This tribe is inhibits Southern Kenya and Northern Tanzania and has very distinctive customs and dress, and because of their acquired ability to produce food in deserts and scrublands, Oxfam has suggested that their lifestyle be adapted as a response to climate change. Unlike us, they are nature friendly people. Eventually, having asked to fit all these things in one egg which apparently seemed big later seemed small and therefore a challenge. I thought I should rather have been given a dinosaur eggs and hesitated to commence the project and once I started drawing on the egg, the challenge seemed to have transferred itself from theoretical to practical terms. The surface was dotted and shiny to an extent that it seemed to have been polished. Hence, I at least erased the drawing thrice to get the subjects fit into a strategically favourable spot knowing that eggs are round. And then came another version of the fun part; the painting stage. The slippery surface didn't allow strokes but rather blobs of paint to cover it, this required the egg to be divided into at least three parts where I could approach the next side once the previous one had dried out. Once this was done, I applied another coat of brush strokes thereby adding depth and contrast. And then add another 4 to 5 days for varnish coats and them drying out in their sweet time in this humid weather. So now this egg will either have a glass enclosure or probably some other ways of preservation. Till I find another ostrich egg, adios! It's the biggest egg in the world. You would be surprised that the eggs of the extinct Giant Moa of New Zealand and the Elephant birds of Madagascar were much larger than an ostrich egg but then humans happen and make animal species extinct. 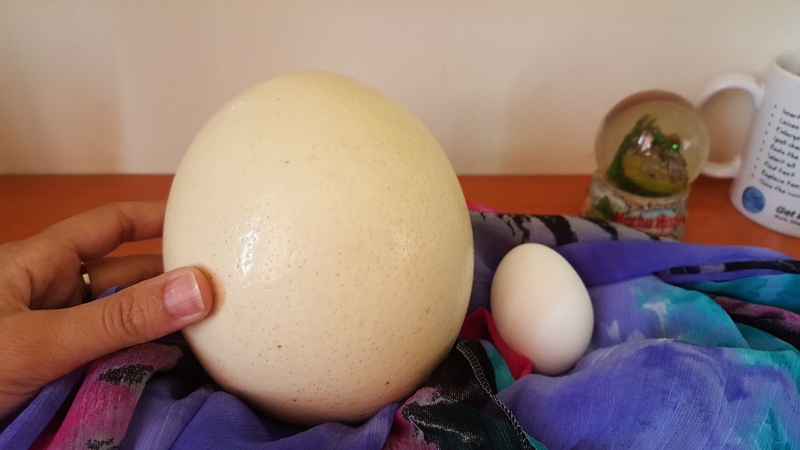 An ostrich egg measures approximately 15 - 18 inches in circumference and 6 inches in length. It has a thickness of 0.06 inches, hence the very hard shell. It contains 2000 calories and is rich in vitamin A and E, calcium, phosphorus, other than traces of magnesium, zinc, copper, iron, selenium, and manganese, 47% proteins and 44.3% fats. The incubation period lasts for about 35 to 45 days. This is ahhhmazingly beautiful. you are a great artist hiba. keep up the good work.